Donors receive an instant tax receipt for 100% of the amount donated. Each successful transaction is maintained within the In Memory Of Platform (IMO). 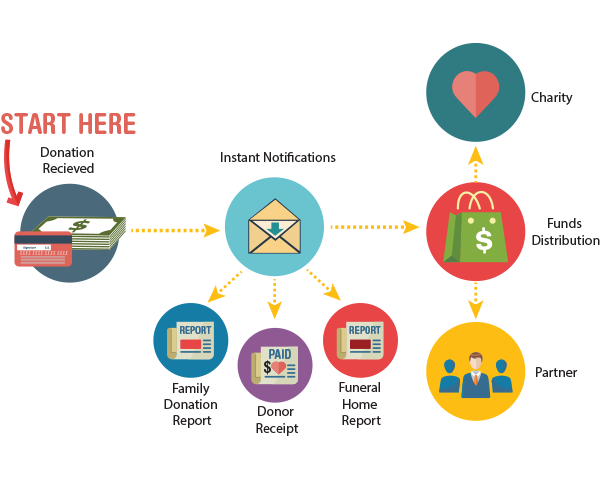 The IMO platform is responsible for tracking all aspects of the donation process. This includes providing reports for the website vendor, the funeral home, the families, and the charities. Payments are processed monthly. Charity reports are available through OrgHunter.com. Each charity must successfully complete a onetime OrgHunter vetting before gaining access to donor reports for their charity. This ensures we protect the donors each step of the way.